Eschewed by visitors for years, Northern Ireland has made a comeback following The Good Friday Agreement (1998), a power-sharing contract seeking to promote peace. Since then, Ulster (as Northern Ireland is also known) has rebounded both economically and culturally and is one of the world's must-see destinations. Most recently, Northern Ireland's role as the filming location for Game of Thrones has brought another wave of tourists. For those in the know, even during the bad times, this corner of Ireland was always high on the sightseeing agenda. Legendary natural attractions, such as the mystical Giant's Causeway, join newer arrivals, such as Belfast Titanic, as top things to do. The power-sharing government has invested massively in making Ulster attractive to visitors. There's great shopping, world-class restaurants, a remarkable history and culture, outstanding golf, and a lively music scene. These add up to plenty of places to go in Northern Ireland for families, couples, and solo travelers, all of whom can be assured of a warm and friendly welcome. If visiting from the Irish Republic, remember you're crossing the border into a separate sovereign country. Here, you'll need £'s Sterling, not the Euro as used in the south. Famed around the world for its columns of layered basalt, the Giant's Causeway is Northern Ireland's only UNESCO World Heritage Site. These polygonal-shaped natural features were created by a volcanic eruption 60 million years ago. Today, they are the prime focus of a designated Area of Outstanding Natural Beauty. Three different periods of volcanic action birthed the Lower, Middle, and Upper Basalts. The Middle Basalt rock forms the famous amphitheaters of columns shaped like hexagons. That's the science, however according to legend it was carved out by the mighty giant Finn McCool who left behind his ancient home to do battle with his foe Benandonner across the water in Scotland. Various names bear testament to this engaging myth, The Giant's Boot, The Wishing Chair, The Camel, The Giant's Granny, and The Organ high up on the cliffs. Weather permitting you might even see Scotland in the distance. Naturally, most visitors' first stop along this scenic coast is the World Heritage-listed Giant's Causeway. The surrounding coastline, however, is magnificent and shouldn't be bypassed. Many treats await, including the beautiful beaches, dunes, and rolling waves at Portrush (where there's a world-class golf course) and Portstewart. If you're feeling brave enough, either is perfect for a bracing dip. An easy ten-minute drive west, through the picturesque village of Bushmills, brings you to ruined medieval Dunluce Castle. It's impossible to miss, perched precipitously on the cliff edge, the kitchen having plunged into the thrashing waves below one terrible night many centuries ago. The only survivor, apparently, was the kitchen boy who was perched on the windowsill and had to be rescued. An easterly drive from the Giant's Causeway of around 15 minutes brings you to another of Ulster's must-sees, the vertigo-inducing Carrick-a-Rede Rope Bridge, near the beautiful coastal village of Ballintoy. This is not one for the faint-hearted. The vertiginous bridge joins to a tiny island where fisherman would catch salmon. Access, if you dare, is free. A striking landmark, this star-shaped building representing the White Star Line logo traces Belfast's maritime history and honors the story of the Titanic. Belfast was once the powerhouse of British Empire shipbuilding, a fact that can't be missed in this part of the city. There are nine interactive exhibitions on this spot where the infamously ill-fated ocean liner Titanic was built. Enjoy a guided tour around the slipway and dry-dock and, for an additional fee, visit the SS Nomadic. There's a restaurant, café, and gift shop too. This truly is a world-class tourist attraction. It's not just the North Antrim coastline that beguiles. Inland are the nine Glens of Antrim, each exuding its own charm. Drive from Ballycastle towards Larne along the main A2 coast road, and serene lakes, tumbling waterfalls, forest trails, and rolling hills await. Glenariff, the 'Queen of the Glens', is the most famous of the nine. Along the way, notice the Glendun Bridge, an excellent example of innovative design and construction. Ballypatrick Forest Park has a ten kilometer loop drive around Carneighaneigh Mountain which is especially scenic. The small seaside resort town of Portrush, on the County Londonderry border, is home to the Royal Portrush Golf Club and one of the world's most challenging links golf courses, the Dunluce Links. Around 20 minutes' drive from Belfast is the substantial town and port of Carrickfergus, home to imposing Carrickfergus Castle. One of the best-preserved medieval structures in Ireland, this Norman castle has seen off foes over eight centuries. Perched near the shore and dominating the town, the fortress is still intact and the recreated banqueting hall is a particular treat, especially for kids. You can pick up a guide at the visitor center and explore the interior and battlements at your leisure. Nearby is the Andrew Jackson Centre, the reimagined ancestral home of the 7th president of the USA. South of Bangor, at Donaghadee, is the start of the 32-kilometer-long picturesque Ards Peninsula. From Donaghadee, a road runs along the Irish Sea coast to Ballywalter with its beautiful beach, Ballyhalbert, and finally Cloughy, where it turns inland to Portaferry. Serene 18th century Mount Stewart House and Gardens is well worth stopping off to admire and it's only a ten-minute drive or so from Ballywalter. On the west shore of the Strangford Lough is the resort of Killyleagh, with Hilltop Castle overlooking the town. On a good day, you'll see the famous Mourne Mountains shimmering in the distance. Portaferry is on the peninsula's southern tip where there's a ferry link to Strangford. Either that or make the drive, which skirts the west side of the peninsula by the shores of Strangford Lough. Around 15 minutes drive from Belfast city-center brings you to this 'living' museum designed to show Ulster life more than 100 years ago. There are rebuilt labourers' cottages, working farms, rural schools, and village shops as they once were, as well as 170 acres of parkland to explore. Visitor guides demonstrate traditional crafts around the various locations. You can clamber aboard steam locomotives and explore the Transport Museum with its impressive collections of electric trams, fire engines, motorbikes, beautiful vintage cars, and horse drawn carriages. A visit here is a day out in itself. 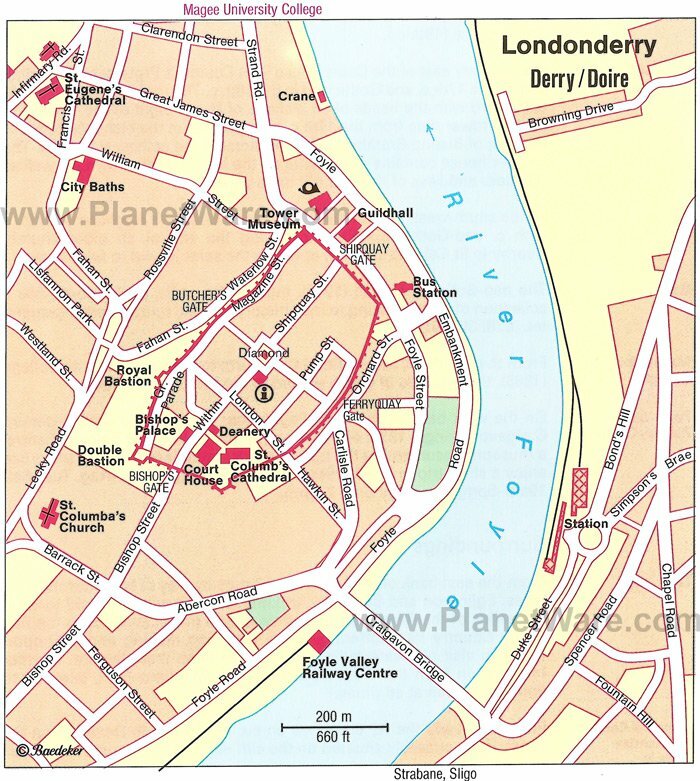 The second city of Northern Ireland, Londonderry, or Derry, as it's more commonly known locally, lies where the River Foyle opens out into the sea-lough of the same name. The town has been robbed of part of its natural hinterland of Donegal by the division of Ireland, yet remains an important port and industrial center with a traditional textile industry, chemical and mechanical engineering plants, and ceramics factories. With its attractive surroundings it's a popular tourist center and a good base for trips into the Inishowen Peninsula and Donegal in the Republic of Ireland. The town itself has an almost completely preserved circuit of medieval walls and a number of interesting old buildings. Two connected lakes combine to form Lough Erne, in County Fermanagh, a favorite for fishing, kayaking, or exploring on a day cruise. Castles and manor houses dot its banks, and its islands are a main attraction. A 12th-century round tower dominates Devenish Island's ruined Augustinian priory, and mysterious carved stone figures on White Island and Boa Island were the work of Celts between AD 400 and 800. The 39-mile Shannon Erne Waterway connects Lough Erne to the River Shannon in Ireland. Once you have seen the highlights of Northern Ireland, you may want to cross into the Republic of Ireland and explore its capital, Dublin. Or you might consider the options available by ferry from Belfast. Two ferry routes connect Northern Ireland to Scotland, one from Belfast and the other from Larne, each about a two-hour trip. Ferries also depart Belfast for Liverpool, in England, and twice a week ferries travel to the Isle of Man, in the Irish Sea, halfway between England and Ireland.